If you're having a bet at Aintree today then it pays to choose your bookie carefully. In the 2.00 Paddy Power are refunding win bets if your horse finishes 2nd or 3rd. But if you're betting each way then Bet 365 are paying 1/4 odds instead of 1/5. In the Fox Hunters at 3.40, you can have 4 places on your each way bets with Paddy Power, Bet 365 and Sky Bet. And in the 5.25 you can get 5 places from 888 Sport. Bet 365 are as always giving a free bet on the next race if you back a 4/1 or bigger winner and in most cases they are the best place to bet, they also guarantee they will be best price on all the Channel 4 races. If you already have a Bet 365 account then a Sky Bet account will get you a matched first bet as well as a free £5 bet every week. Sky bet are also refunding bets if the favourite wins the 1st race today or tomorrow. Also if you bet £50 with Sky Bet (can be spread over multiple races), new and existing customers can earn a free £10 bet by using the coupon code AINTREE50. So basically if you do all your betting at Sky Bet today, as long as it adds up to £50 in total, you will get a free £10 bet tomorrow. Terms apply. Sky Bet. We are already in February and that means we should be thinking about Cheltenham. There are a few tipsters that I pay special attention to during the festival and I'll be telling you who I think you should pay attention to in order to make your Cheltenham a profitable experience. 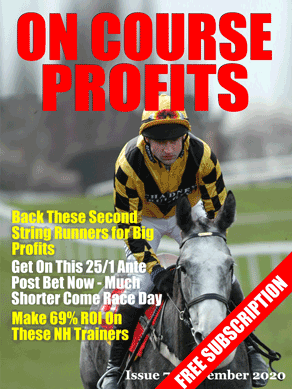 One of the best tipsters when it comes to Cheltenham is Irelands own Nicky Doyle. Today he kicks off his Cheltenham recruitment campaign and if you join him through my link a few pennies will be deposited into the Daily Punt tea kitty. And anybody that sends pennies to our tea kitty deserves a reward. If it's something you want to join, and I can't imagine why it wouldn't be, then once you've joined email me with your Receipt code and I'll send you the rules for a system that does very well at this time of year. You know I like to test systems live, going forward before I rely on them with my own cash. This one was added to my HorseRaceBase account on 15th February last year. There are only bets during the main National Hunt season with about 1 per week on average and since I added it and started live testing it has made a 63% Return on Investment. There are only two simple rules but this is a simple system that's worth including in your portfolio. To make sure the pennies hit our tea kitty make sure that on the Clickbank payment page it says (affiliate=dailypunt) at the bottom centre of the screen. One of the benefits of starting out online betting these days is that there is free money to be had to get you started. There are loads of bookies that will give you free money via various bonuses to encourage you to open an account. Now of course the reason they give these bonuses is because they expect you to lose the money back to them!! But if you take your betting serious and are only betting when the value is on your favour then it really is free money and can make a big difference to your betting, because it means you have a bigger bank to work with. Good offers come from Paddy Power who match your first free bet up to £50 – Paddy Power. Skybet do a £30 matched bet and Bet Victor do one at £25. But these matched bets are just one hit wonders and the best thing to do with those is to lay them off at Betfair. Betfred are currently offering a totally free £10 bet if you open a new account with them. Having worked on the Debutants Lays I've been thinking a lot about laying over the past days and whether we should be creating a lay system from scratch using an idea that comes in a moment of inspiration. Or, is it better or as good to start with a backing system that has failed? Looking through backing systems that I've tried to create over the past year, ones that never progressed far enough to publish here, I see some that have performed worse from a backing perspective than the Lay Debutants would have performed if that was a backing system. These are systems that had profitable past results but have lost consistently going forward. So what I'm saying is that I may have inadvertently created some good lay systems. I have some with SP returns of minus 50% but they don't have the volume of bets that the Debutants system, but it may be that a better plan is to find a collection of small volume laying systems. I'm going to revisit these systems and see if we can make ourselves a portfolio of laying systems that will make us some steady profit. Watch this space. Todays Debutant Lays, we still havent had a losing bet from these, so don't be surprised if we hit one soon!